There’s more to the world-famous heads of Easter Island than meets the eye. 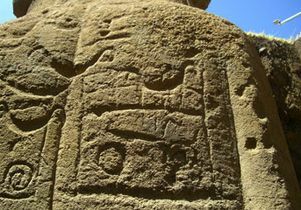 Ask archaeologist Jo Anne Van Tilburg, a research associate at the UCLA Cotsen Institute of Archaeology and director of its Rock Art Archive, who has been lecturing and writing about Easter Island’s iconic monolithic statues for years. 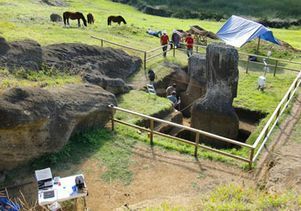 As the director of the Easter Island Statue Project — the longest-continuous collaborative artifact inventory ever conducted on the Polynesian island that belongs to Chile — Van Tilburg has opened a window on one of the greatest achievements of Pacific prehistory on one of the most remote inhabited islands in the world. She and her team of resident Rapa Nui have spent nine years locating and meticulously documenting the nearly 1,000 statues on the island, determining their symbolic meaning and function, and conserving them using state-of-the-art techniques. 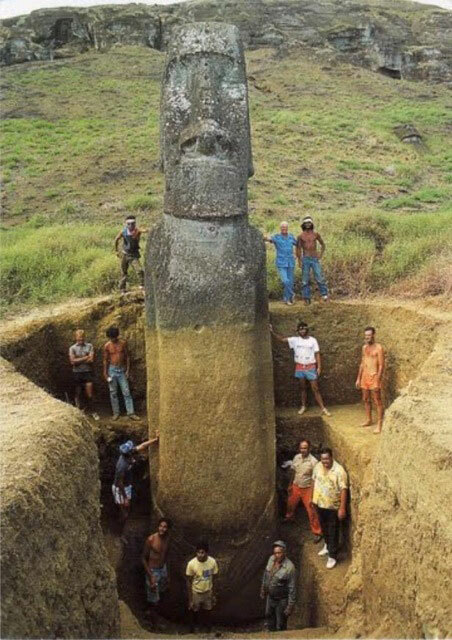 After spending four months over the last two years excavating two of the statues and posting the results of their digs on the project’s website, Van Tilburg was surprised to discover that a large segment of the general public hadn’t realized that what they knew only as the Easter Island "heads" actually had bodies. The two "heads" in the quarry where Van Tilburg’s team dug are standing figures with torsos, truncated at the waist, that have become partially buried by eroded dirt and detritus over centuries. 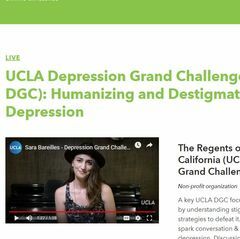 When Van Tilburg posted photos of the excavated statues on the project’s website about four months ago, the blogosphere lit up with surprise, generating a mass flurry of emails. 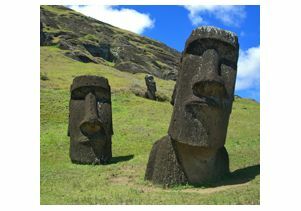 Three million hits later, the Easter Island Statues Project (EISP) website crashed. "I was completely blindsided," said Van Tilburg, who is back in Los Angeles, but will return to Easter Island in October to continue excavating. "But now I quite understand it, because most of the photographs that are widely available on the Internet, and certainly in books, deal only with the very photogenic statues that are located on the slopes of the quarry in which they were carved." 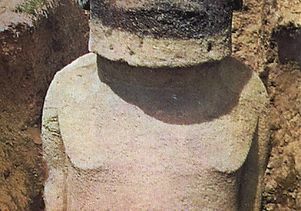 Buried to mid-torso, she said, the statues (which the Rapa Nui call moai, pronounced MO-eye) "do appear to be heads only. 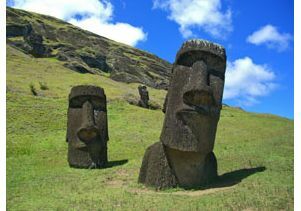 And, indeed, over the years, the statues were usually referred to as the Easter Island heads. But now people are aware they have bodies. I think that’s fabulous. I love it when good science can be turned into public information so quickly." While many of the statues were moved by their creators to ceremonial sites, about half of the statues remain in and around the quarry, the Rano Raraku volcano crater. Attempts have been made to excavate more than 90 of the 149 statues that are upright and buried to their torsos there. But the EISP’s two excavations are the first in that location to be methodically done and documented according to archaeological standards, Van Tilburg said. The excavations, which began in 2009, are funded by the Cotsen Institute, the Archaeological Institute of America and EISP. 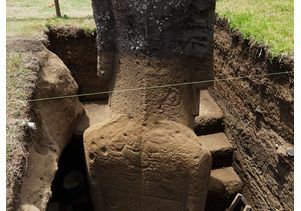 From her studies of these two statues, the archaeologist is convinced that the statues were partially buried naturally by eroded dirt, not by the Rapa Nui. She found approximately the same amount of dirt that partially buried the statues also filled the quarries located near where they stood. The excavations also revealed other facts about these megaton behemoths. 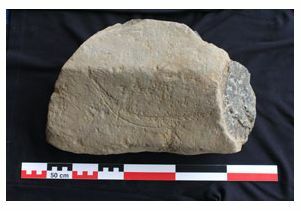 While petroglyphs have been seen before on parts of the statues that were above ground, Van Tilburg’s excavations extended down to the base of the statues and revealed etched petroglyphs on the backs of the figures. She was especially intrigued by the repetition of crescent shapes that represent Polynesian canoes, she said. "What we found underneath the base of one of the statues was a signature stone, a basalt rock with an incised drawing of a crescent, or canoe motif" she said. Van Tilburg believes this was the mark of its carver or the family group to which the carver belonged. "Over time, it seems, more of these canoes were etched onto the statue in a constant repetition of identity reasserting who they were. As the community lost a sense of identity over time, perhaps they wanted to mark these statues as their own," she said. "Easter Island: The Mystery Solved"
Explorer Thor Heyerdahl excavated this Easter Island statue in 1954-55. The UCLA project is the first, legally permitted archaeological project in the quarry since Heyerdahl's dig. Photo is from Heyerdahl's book, "Easter Island: The Mystery Solved." Between the two statues, the diggers also uncovered evidence of the technology that was used to move the large statues upright — one of the statues Van Tilburg worked on stood 21 feet (about two stories ) tall. "We found a round, deep post hole into which the Rapa Nui had inserted a tree trunk," she said. Van Tilburg said ropes were attached to the tree trunk and to the partially carved statue. "We found a rope guide that was actually carved into the bedrock near the statue." 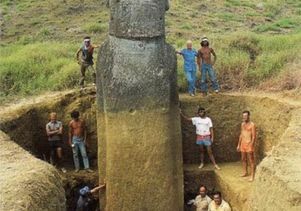 The Rapa Nui then used the tree trunk to raise the statue upright. Before the statue was upright, they carved its front. Once it stood erect, they finished the back, Van Tilburg explained. The excavation team also found about 800 grams of natural red pigment — nearly two pounds — in the burial hole, along with a human burial. Van Tilburg believes the pigment was used to paint the statues, just as the Rapa Nui used pigment to paint their bodies for certain ceremonies. The unusually large amount of pigment found indicates that it might have been used by a priest or chief, perhaps as part of mortuary practice, she said. Human bones were found throughout the dig, indicating that people buried their dead around the statues. To protect the statues from water damage, Van Tilburg’s team, which included Monica Bahamondez, director of Chile’s National Center of Conservation and Restoration, applied a chemical solution to the surface and then refilled the hole they had dug. 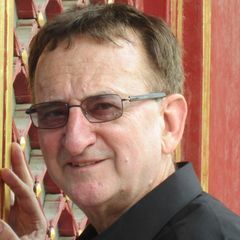 Cotsen Research Associate Christian Fischer, working with the UCLA/Getty Master’s Program on the Conservation of Ethnographic and Archaeological Materials, aided in this effort. "Conservation is a really important part of what we’re doing," the archaeologist said. She said she hoped that Rapa Nui young people can be trained and employed to treat the remaining statues standing in the quarry. The Rapa Nui National Park, the agency in charge of this World Heritage site, and Van Tilburg and her team are planning together to make that a reality. "The entire staff that I work with on Easter Island are from Rapa Nui. I’m very proud of that," said Van Tilberg. 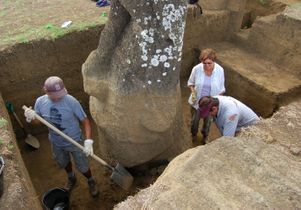 To learn more about the Easter Island Statue Project and see more photos, including those of the Rapa Nui excavation team, go here. A 2009 story in Backdirt, a magazine from the UCLA Cotsen Archaeological Institute, focuses on the project to save the moai.